Is Loosely Exactly Nicole in danger of being cancelled? Today, MTV announced the series will be moving to Fridays starting next week. 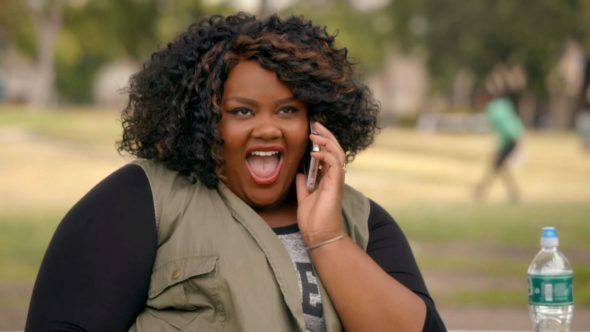 The comedy stars Nicole Byer as a semi-fictionalized version of herself, a young woman trying to make it in Hollywood. The cast also includes Fahim Anwar, Kimrie Lewis-Davis, Rachel Hilson, and Sophie von Haselberg. So far, the show’s first season has not fared all that well in the ratings. Six episodes in, the series has earned an average of .12 in the 18-49 demo and only 234,000 viewers. Moving the show to Fridays at 10 p.m. could indicate a possible cancellation. As of reporting, MTV has not announced whether the show will be renewed or cancelled. What do you think? Do you watch Loosely Exactly Nicole? Do you think the show should be renewed? More about: Loosely Exactly Nicole, Loosely Exactly Nicole: canceled or renewed?, MTV TV shows: canceled or renewed? I enjoyed the show i don’t want it to go! Please Please Please do NOT cancel this show! It is widely versatile which makes it hilarious. Nicole and her cast members are the best mix. This show is so true to life in many ways. I seriously hope this show is not on the chopping block! Nooooo ! Don’t cancel it .. I was sad that there wasn’t even an episode monday night .. and to find out its moved to friday like ugh !!! Please keep this show for season 2. She has such a great future in comedy. I think this show is really funny, I loved Nicole on Girl Code so I knew I’d like her show. I hope they don’t cancel it! I love this show. I have to hold my sides cause I’m laughing so much. I would hate to see another show i love get cancelled. Soon i will have nothing to watch on MTV.